Absolutely not; there is no such thing as being too out of shape to begin training! At Morning Star Jiu Jitsu we pride ourselves in getting our students in the best shape of their lives. That’s a main reason why many people take up martial arts training in the first place. Your first months of training are guaranteed to transform your body, and our instructors will be there motivating and helping you every step of the way. Yes. All of our instructors teach private classes that can be scheduled to fit your needs. We also offer morning and weekend classes. Contact us and we’ll be sure to work something out; we don’t want you to miss out on training! We are happy that you have decided to train with us! We recommend that you come visit the gym so that you can see where we are located and thus make an informed decision when enrolling. You can stop by at any of our class times, or contact us to schedule a FREE INTRO CLASS. We are 100% positive that you will be very satisfied with your decision! While most traditional martial arts focus on striking, Brazilian Jiu-Jitsu and Submission Wrestling concentrate on grappling and especially ground fighting. As one can imagine, it is a significant tactical advantage to specialize on what most styles don’t offer. It makes grappling arts extremely effective in self-defense and one-on-one fighting situations when compared to other disciplines. Another major difference is that traditional martial arts usually follow a standardized technical curriculum and focus on non-reality based sparring such as point fighting. The nature of grappling is one of constant evolution, where the student is always developing new skills and techniques. Grappling also allows for realistic sparring at the gym, where one can test their skills on a daily basis while still being safe. No! Our main focus is teaching proper techniques to our students for self-defense application as well as competiton in tournaments. Jiu Jitsu is known as the "Gentle Art" and is a lot easier on the body with much less chance of injuries. You are never too old to learn how to defend yourself. We never make anyone spar who does not wish to, but sparring is an important part of the learning process because it exploits your weaknesses and strengths so you and your instructor can track your progress. Sparring will also teach you how to apply techniques to a fully resisting opponent. What we will do is have you spar with an instructor first or with some of the advanced students who are knowledgeable on how to grapple with new students. We find that most people, once they get the taste of sparring, realize that it is fun, a great workout and want to then spar more. Do I need any previous experience to join Morning Star Jiu Jitsu? Absolutely not. We love teaching beginners and cater to the needs of each student's ability and experience. No! We primarily teach effective self defense and competition techniques. Most of our students enjoy the challenge of learning something new, while also getting fitness and self defense benefits out of our classes. 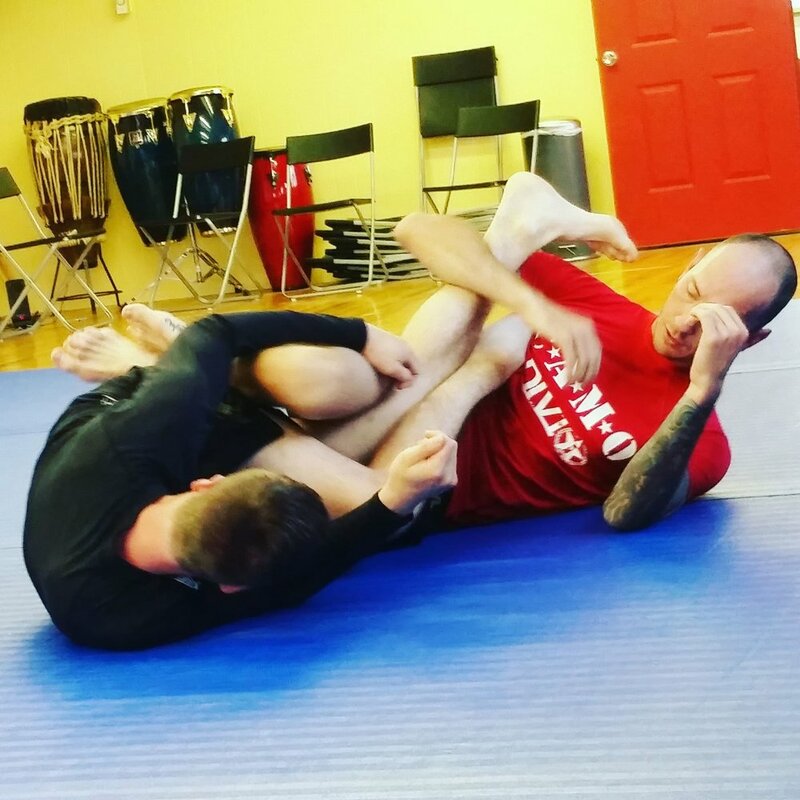 You can wear gym shorts and a t-shirt all week when trying out Morning Star Jiu Jitsu.